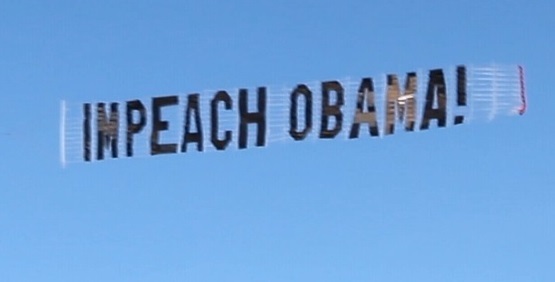 The Impeach Obama NOW group is planning to fly an “IMPEACH OBAMA – TERRORIST” sky-banner over the Veterans Day Parade in Downtown San Diego on November 11, 2015. A sky-banner makes a dramatic statement at such events. We have flown several such banners in the past around the country. Below is a photo of the banner we flew over the Rose Parade. The event will be recorded and uploaded to YouTube and FaceBook. Also, there will be local media at the parade. National exposure is expected for this event. So, we need everyone possible to participate. The flight broker gave me a quote. The price depends on how long we want the plane to be overhead. For $595 + $2 per character, we get a flyover, which may be good enough. The plane makes a couple of laps around the grandstand and parade route. For $990 we can have the plane fly over the area for an hour. A flyover seems fine to me and it is a good price. If the flight does not go off for some reason, your money will be returned upon request. If it is rained out, though, the broker will not return the money after I have signed the contract, but they will not refund my money but fly the banner on a different day. So, let’s hope for sunshine! Will check the weather, before signing. Contribute via PayPal or GoFundMe(credit cards accepted). If your name does not appear on this list, let me know via the e-mail (sonsandiego@gmail.com). Note: GoFundMe accepts credit cards. Apparently, PayPal no longer does. There will be protesters on the ground, also. We will have extra signs. If you want to make your own sign, suggest something like “HONOR VETS” or “HONOR OUR FALLEN” “IMPEACH OBAMA”. Please no signs for candidates of political parties. We want to make this protest about Obama’s crimes and not about politics. Sings about issues that you believe warrant his impeachment and removal are also welcome, illegal amnesty, dictated gun control, non-eligibility, war on religion, support of terrorists, sovereignty-destroying trade deals, etc. Just a suggestion. Of course, it’s a public area and you can hold any sign you want. The currently planned location of the protest is in front of the San Diego County administration building across Harbor Street from the parade grandstand, where many officials, veterans and local media will be viewing the parade (and also our protest). This is a video of a previous banner flown at the same location as the parade will be when a protest against Obama’s war on religion was taking place. We expect that the crowd of veterans and their supporters will cheer even more loudly when the banner appears overhead. PARTICIPATION IN OTHER CITIES: If you want to participate, but do not live in the area, have a protest in your town and send us photos, so they can be shared. Whether you can hire a banner or not or even if you have a parade or not does not matter. Send photos of a protest, large or small and they will be posted in our report, even if it is a solo protest.